We moved to a new house about 2 years ago and just today I was digging through a closet and made quite a find…a full case of Everclear! Score! I know well what to do with this so I decided that first I’ll revisit the organic vs. non-organic results. My first replication study, as it were. I had a couple reasons for this, one of which is the price of lemons. Lemons have gotten increasingly expensive, especially the organic variety. I bought both types and the conventional ones were 3 for a dollar but the organic ones were about $1 each. Sounds crazy at first, but there is actually a big difference in the lemons. Check the pics below. Normally organic produce is smaller and uglier than conventional produce but not so in this case. The big, beautiful lemons are the organics. The puny looking ones are the conventionals. There was still a color difference as you can see below…but mostly I was intending to equalize the quantity of zest, a step I didn’t take the last time I conducted this experiment. 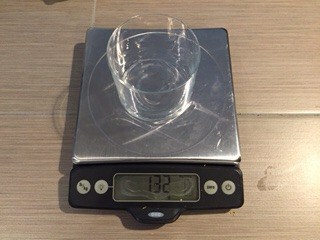 So I zeroed out the glass and weighed the zest. I had 8 organic lemons and 9 conventional lemons to account for the difference in size of the fruit. As I started to even out the two glasses it looked like there was a LOT more organic zest according to the scale. But when I actually started moving the zest around I realized the two quantities were actually very close. Then I figured out that while they look identical at first glance, my two drinking glasses have very different thicknesses in the base and there was a huge weight difference between them. I should have thought of this out of the gate, but it’s easy to overlook! I know organic is better but if you are only using the juice and not the zest is it ok to use regular? I would rather use organic but at $5.99 for a bag of 6 it is not something I can do everytime I want lemon juice. Kroger was out of lemons yesterday but this morning I had to have my lemon water mix. I went to Whole Foods and to my surprise a good size bag of organic lemons was only $4.99. I couldn’t believe the taste. It is so much better than the regular lemons. It is absolutely delicious and now I am spoiled for life. You got it Rick, the organics are coming down in price and they are better. No one will convince me otherwise.